Morley is a small parish close to the market town of Wymondham. The small village of Morley St Botolph is in the north of the parish, and the rest of the landscape is dotted with farms. Morley is shown on an early 17th century map surveyed by Thomas Waterman, and many of the present field boundaries can be traced on the map. The name Morley comes from the Old English meaning ‘a woodland clearing in or near a moor or marsh’. The earliest archaeological find from the parish is a Palaeolithic flint handaxe (NHER 29416). Prehistoric pot boilers (NHER 12962, 12964, 33653, 34654), flint implements (NHER 25460, 29927 to 29937, 30533, 30534, 30540) and a fragments of late prehistoric pottery (NHER 30544) have also been found, as well as a Mesolithic flint implement (NHER 9113), an axehead (NHER 29417) and a microlith (NHER 33229). Fieldwalking has recovered Neolithic flints (NHER 13561), including scrapers (NHER 12963) and axeheads (NHER 33229), a polished stone axehead (NHER 20568) and Beaker barbed and tanged arrowheads (NHER 9114, 9115). A Bronze Age socketed axehead (NHER 33229) has been found during metal detecting. An earthwork mound of unknown date (NHER 8905) was destroyed during the enclosure of the parish in 1816. Bryant identifies the mound as a Bronze Age round barrow but its exact location is unknown. Although no specific settlement sites have been identified, there is some evidence of Iron Age occupation in the parish. Many fragments of Iron Age pottery (NHER 25460, 29928, 29929, 29937, 30533, 30534, 30544, 30545) have been found during fieldwalking, and an Iron Age coin (NHER 12893), a toggle (NHER 25719), a flint knife (NHER 30535) and a tankard handle fitting (NHER 33229) have also been found. Fieldwalking has revealed the site of a Roman settlement (NHER 30539), and the large amount of Roman pottery recovered from the site is suggestive of settlement activity over a long period of time. In 1958 two Roman pottery kilns (NHER 9116) were discovered and excavated at Wymondham College. The kilns were mainly producing handled flagons from about AD75 to AD100. A third kiln was excavated in 1962 by the students of the college, and more Roman pottery and kiln waste was recovered. In 1847 a hoard of Roman coins (NHER 8905) was discovered during drainage works. Other Roman finds include fragments of pottery (NHER 19934, 29928, 29929, 29932, 29933, 29936, 29937, 30036, 30532 to 30538, 30544), brooches (NHER 12893, 33229, 25460, 37443), a miniature iron axe (NHER 17514), a second coin hoard (NHER 25460) and a gold ring set with a garnet (NHER 28986). There is comparatively little evidence of settlement during the Early Saxon period, and fragments of Early Saxon pottery (NHER 30533) and two brooches (NHER 33229, 29937) are the only Early Saxon artefacts to have been recovered from the parish. In contrast, fieldwalking and metal detecting in Ravens Grove field has revealed the site of a small Middle Saxon settlement (NHER 29937). Settlement activity on the site seems to have been more intense during the Late Saxon period, but very little early medieval pottery was recovered. An excavation of a large area of the site by the NAU in 2002 did not reveal any archaeological features, although an Early Saxon brooch and three post medieval lead weights were found by metal detecting. Fragments of Middle Saxon pottery (NHER 25460, 29927, 30533) have been found elsewhere in the parish, as well as a silver sceat (NHER 35303) and a rare example of a ‘mule’ coin (NHER 33229). In the Domesday Book Morley is recorded as being held by William of Warenne and Ralph of Beaufour. An un-named priest held 1 carucate of land and 19 smallholders under the Warenne holding, and the Beaufour holding included a number of freemen and 9 villagers. In 1958 workmen discovered a hoard of over 800 Late Saxon silver pennies hidden in a pottery jar (NHER 9117). The coins were dated to the late 9th and 10th centuries, and further investigation on the site recovered Late Saxon pottery and animal bones. Late Saxon pottery (NHER 19934, 25460, 29927, 29928, 29934, 30533, 30534, 30542), coins (NHER 31310, 37661), a key with openwork decoration (NHER 33865) and a bridle cheek-piece in the shape of an animal’s head (NHER 33893) have also been found in the parish. 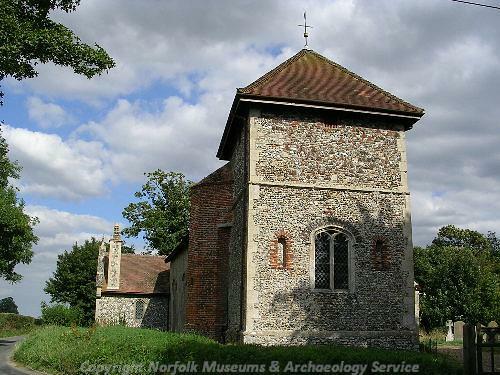 St Botolph’s Church (NHER 8932) dates mainly from the 14th and 15th centuries, but with some evidence of Norman work including reused stonework and a stoup. The church was restored in the late 19th century, but was badly damaged by a fire in 1959 before it was restored and re-roofed in 1962. St Peter’s Church (NHER 9134) dates from the 15th century, and has a distinctive truncated west tower with a pyramidal roof. Several rectangular ditched enclosures (NHER 12178) are visible as cropmarks on aerial photographs close to St Peter’s Church. The enclosures are probably part of an area of deserted medieval settlement around the church. A medieval moat (NHER 29722) surrounding The Rectory is shown on Waterman’s map of 1629. Part of the moat survives to the north of the house. The map also shows a large green close stretching out along the course of the modern Deopham Road. Fieldwalking has recovered concentrations of medieval pottery (NHER 29929, 29930, 29931, 30541, 30843) from the fields next to the road, suggesting that the edges of the green were settled during the medieval period. The site of another medieval settlement (NHER 30539) has been located on a lane leading from another green to St Peter’s Church. Some very slight earthworks (NHER 34252) have been recorded in a field close to Wymondham College. The earthworks are probably the remains of a medieval to post medieval enclosure, common and common-edge ditch that are shown on Waterman’s map. Medieval coins, pottery and metalwork have been found scattered throughout the parish. A coin hoard (NHER 34252) dating from the reign of Henry III was found by a metal detectorist in 1999. Other interesting finds include a 12th century dog lead (NHER 12893), a 13th to 14th century ring brooch (NHER 28987), a late medieval sword belt fitting (NHER 30937) and a silver medieval brooch (NHER 34653). Morley Old Hall (NHER 9118) was reputedly built in the mid 16th century for the Sedley family. The present hall appears to date from the late 16th century and has ovolo-moulded windows with brick pediments and two crowstepped dormer windows. The chimney stack to the south has a garderobe projection and the house has an original hardwood staircase. The curving parish boundary between Besthorpe and Morley to the south of the parish is suggestive of a medieval deer park (NHER 9135). The park may have been associated with Morley Old Hall, which stands close to the Morley Manor (NHER 9133) is a complex timber framed building that was constructed in several phases. The earliest phase dates from the 16th century, and the building was altered and extended in the early and mid 17th century. Further alterations were carried out in brick in the 18th century. The east wing of the building may have functioned as a court house in the 17th century, with a steward's house in the west wing. Woodlands (NHER 21231) is a 16th century timber framed house with a 17th century central porch with a crowstepped pediment and crenellated parapets. The upper floor of the house was originally open to the roof and there is an original fireplace. Church Farm Farmhouse (NHER 12095) was a timber framed farmhouse that was surveyed in detail before its demolition in the 1970s. The eastern end of the house dated to the 16th century, and the building was extended to the west in the 17th century. Willow Farm (NHER 14539), Hill Farmhouse (NHER 44615) and Firgrove Cottage (NHER 21232) are all 17th century timber framed lobby-entrance houses. Thatched Cottage (NHER 44618) is a 17th century timber framed and thatched cottage with a 20th century thatched porch. Black Barn Cottage (NHER 43173) is a timber framed and thatched 17th or 18th century cottage that was badly damaged by a fire in January 2006. The former Woolpack Inn (NHER 13380) is an 18th century building with an unusual mansard roof. Old photographs taken at the turn of the 19th century show the building before and after several alterations, including the addition of a two storey half-timbered bay window. The building was an inn until 1906 when it became a private house. The Post Office (NHER 44617) is an 18th century timber framed building with a 19th century shop front. Morley Hall (NHER 44616) was built as a boarding school in the mid 19th century, and has giant pilasters and pedimented windows. In 1804 a post mill (NHER 4004) was moved to Mill Farm from the gasworks in Attleborough. The mill remained in use until 1909. Wymondham College (NHER 14759) is on the site of a World War Two hospital used by the USAAF. Rows of Nissen huts, surgical and psychiatric wards and other buildings were constructed on the site during the war. After the war the site was used as an emergency teacher training college for demobbed troops. The hospital became a private school in 1951, and many of the Nissen huts were used as classrooms for several years before being replaced by modern buildings. Sarah Spooner (NLA), 14 June 2006. Norfolk Record Office PD 3/108 Map of Morley St Botolph with Morley St Peter surveyed by Thomas Waterman.